Mixture of incense composed of plants and resin, according to a recipe of Antiquity. - Is burnt on burning coal. - Proposed in a package of 10 hand-shaped pellets. - Presented in a sachet, each wafer individually wrapped. - This product is not food. Each of the perfumes of Cleopatra's Labo is a historical perfume from Antiquity. It is not an imaginary creation: it is always born first of my research, then carried out by hand to the nearest of the original recipe, that is to say with plants, resins or bark without any addition Of essential oils. Preparing a Kyphi is a very long process, requiring several days of preparation and several days of ripening during which the product still gains in density and aromas. 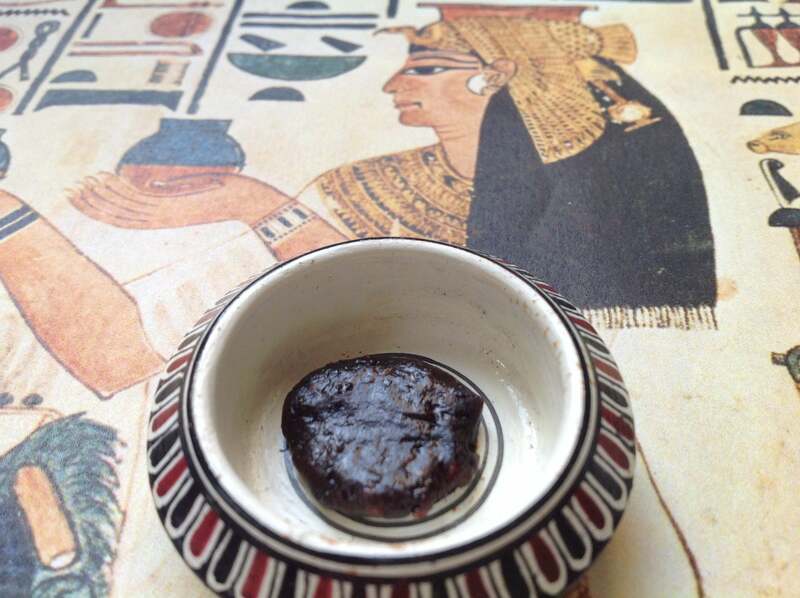 The Kyphi was the sacred incense of the ancient Egyptians. But unlike the other incense, its functions were manifold: burnt, it cleansed the air, constituted an offering to the gods, but it could also be consumed as medicine or even flavored wine. The Kyphi was thus a panacea, a product that had sufficiently marked the whole of Antiquity to find the recipe in many places of the ancient world and at different times. However, it is never quite the same recipe that one finds, although one can recognize it to some common ingredients that form the basis of this incense historical and unique. The kyphi was burnt at nightfall, so it is an incense in the evening. The Kyphi of Galen is actually the recipe transmitted by another physician - Rufus of Ephesus, who lived in the 2nd century - that Galien copied. It was not uncommon at the time: doctors of antiquity and even beyond, it is a long line of scholars who learn especially from each other and who compile knowledge. Again, the Kiphy transmitted by doctors, reveals its link with therapeutics. But this one is a rich Kyphi, very aromatic, with many ingredients that make it a sweet and delicious fragrance. Of all the perfumes of antiquity, kyphi really has a status apart. Use it to soothe yourself, to harmonize with the evening energies, especially if you feel in tune with the Egyptian culture. If you show devotion to an ancient deity of the Egyptian pantheon, kyphi is just right for you! Available in exceptional packaging to offer or to afford a nice box to store rechargeable incense. Consultez-moi pour toute question concernant la vente en gros. N'oubliez pas néanmoins que tout est fait artisanalement par une seule personne, ce qui implique des délais plus longs et des stocks moyens. - Les senteurs du Labo de Cléopâtre sont toutes naturelles, elles sont donc plus rapidement périssables que d'autres. Elles craignent l'eau, l'humidité et la lumière directe du soleil. -Conservez-les dans un endroit sec et non explosé à la lumière. -Les encens se font brûler sur charbon ardent ou système avec bougie, toujours sous votre surveillance, loin de toute substance inflammable et des enfants. - Les senteurs sont uniquement destinées à l'atmosphère et ne sont pas conçues pour la peau. Le labo de Cléopâtre décline toute responsabilité en cas d'utilisation sur la peau.